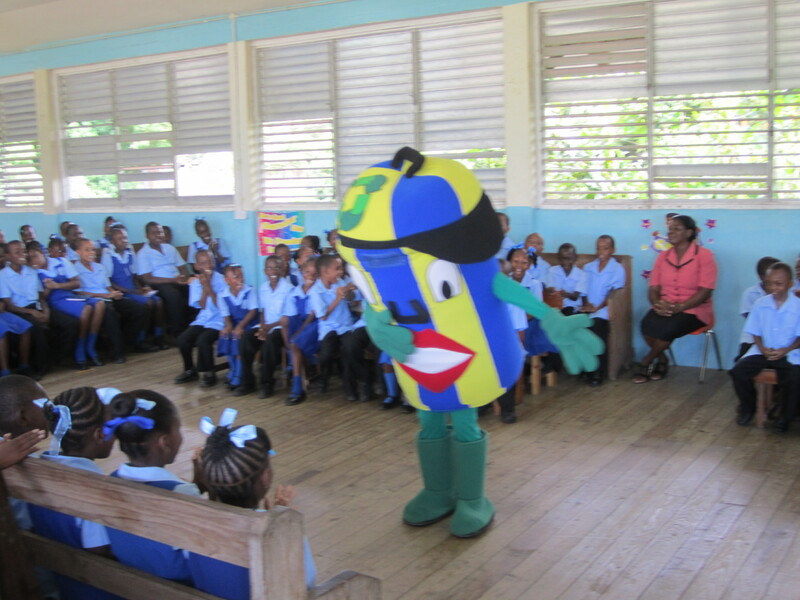 The colorful mascots and students danced to a specially produced theme song and visiting representatives shared information about the importance of protecting local mangrove and watershed areas, with particular attention to the benefits of the Mankòtè Mangrove, one of two RAMSAR sites on St. Lucia, to the surrounding community. Secondary school students were also in awe when popular recording musicians from St. Lucia performed at their schools. The musicians performed their popular songs in an outdoor concert with the themes in the music addressing climate change and biodiversity. In an effort to prepare the musicians to effectively address the climate change theme, the musicians attended a half day seminar conducted by the coalition agencies and the Organisation of Eastern Caribbean States (OECS) Secretariat. It is expected that the exposure to information regarding climate change issues will influence their future musical writings. To date, St. Lucian musicians namely; Ronald “Boo” Hinkson, “Scady P”, “Minelle”, “Nintus”, “Ambi”, “Mongstar”, Shayne Ross and “Q Pid” have confirmed their willingness to attend school and community visits. During the secondary school activities, students were engaged in discussion on climate change, biodiversity conservation and the role of mangroves in eco-system function, with professionals from the coalition, as well as with the visiting local musicians. Students were also treated to various memorabilia and promotional material on climate change. 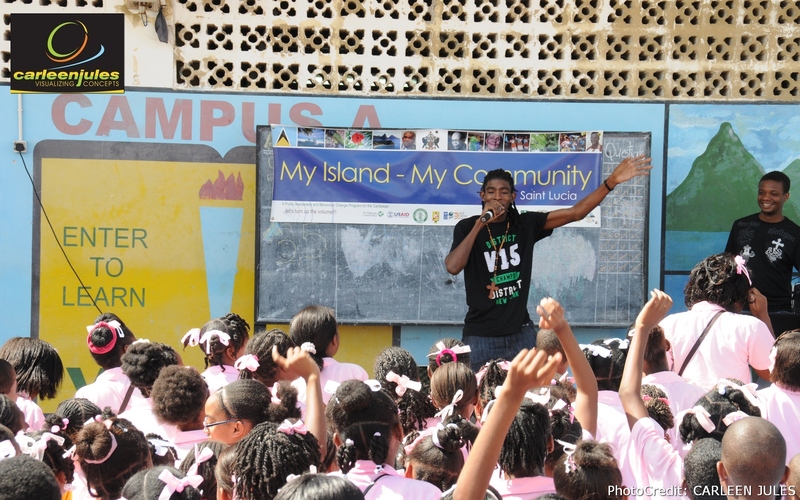 The school visits will culminate in a community cleanup of the Mankòtè Mangrove later in the year. This activity will bring together the students, friends and family together to take action to protect this precious natural resources. The cleanup will also include a number of local musicians, the mascots and promote behavior change towards climate change and biodiversity conservation. PCI-Media Impact’s Alleyne Regis states, “In primary schools children are known to react positively to a mascot costume and hands-on activities. In secondary schools the visiting team adopted a different approach where popular musicians helped convey messages pertaining to climate change”. Through My Island - My Community, PCI Media Impact has been working closely with a coalition of stakeholders including: the St. Lucia National Trust; Government of St. Lucia’s Ministry of Agriculture, Lands, Fisheries and Forestry; Ministry of Environment Sustainable Development and Environment Program; Rizzen FM; Folk Research Center; Radio St. Lucia; Caribbean Youth Environment Network; and St. Lucia Solid Waste Management Authority as well as a cadre of local volunteers all dedicated to the conservation and protection of St. Lucia’s biodiversity. The coalition of stakeholders is focused on raising awareness and promoting action to accelerate adaptive measures that can reduce St Lucia’s vulnerability to the effects of climate change and help communities cope with the changes that are already taking place. 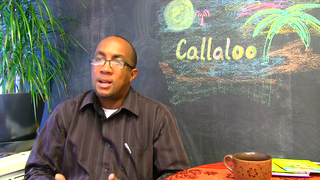 The actions are presented in an appealing way, connecting with the hearts and minds of the audience to encourage communities to take individual and collective actions. My Island - My Community is supported by a partnership of more than 60 national, regional and international organizations and governments that provide local knowledge and technical advice for a successful program including: Caribbean Community Climate Change Centre, GEF Small Grants Programme implemented by UNDP, Global Island Partnership, KfW on behalf of the German Financial Cooperation, Organisation of Eastern Caribbean States, Population Services International, The Nature Conservancy and US Fish and Wildlife Service. Media Impact celebrates "International Day of the Girl"